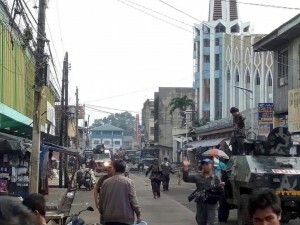 ISIS Loyalists Invaded This Philippine City. Here’s What’s Left. The Latest on a bomb attack targeting a church in the southern Philippines (all times local): 1:20 a.m. The head of the world’s largest body of Muslim-majority countries has strongly condemned the bombing of a Catholic church in the Philippines that killed 20 people and wounded nearly a dozen. The general secretary of the 57-nation Organization of Islamic Cooperation, Yousef Al-Othaimeen has also expressed his “deep indignation” at Sunday’s terrorist attack. He says the OIC firmly rejects all forms of violence, extremism and terrorism, whatever their sources or motives. Separately, the OIC also welcomed the results of a recent referendum in the southern Philippines, which provides expanded autonomy for the region’s minority Muslims in hopes of ending nearly five decades of a separatist rebellion that has left 150,000 people dead. After he took power in 2012, Mr. Xi began running a committee called the Central Leading Small Group on the Protection of Maritime Interests, according to a report by the Brussels-based International Crisis Group that drew on interviews with leading Chinese foreign-policy analysts, some of them government advisers. Almost at once, China’s cautious approach to maritime disputes began to look impulsive. The shift was exemplified by China’s decision in May 2014 to drag an oil-drilling rig into disputed waters off Vietnam, an unprovoked move that shocked Hanoi. The report quotes one unnamed Chinese analyst as saying that when it comes to territorial issues, Mr. Xi “wants to go big and go fast.” That’s been the hallmark of the island-building project. The Philippines, Vietnam, Taiwan and Malaysia all have outposts big enough for airstrips—and have built them. One of Vietnam’s has a Buddhist temple with monks. 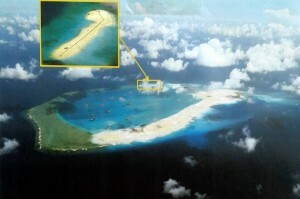 As for China, a few of its eight reefs boast a couple of bare rocks that jut out of the waves. That’s it. 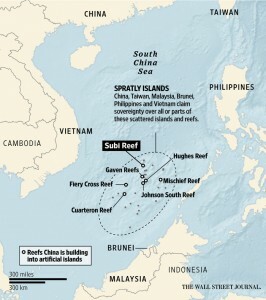 This is an intolerable situation for Mr. Xi, made more irksome by Manila’s decision to launch a legal challenge to China’s territorial claims at a[the] U.N.